Lake Victoria is Africa’s single most important source of inland fishery production, but radical changes to its ecology have rendered much of the deep water anoxic (no oxygen) or hypoxic (low in oxygen) and dramatically altered the food web. Other, more recent changes in the lake, however, are giving respiratory ecologist Lauren Chapman renewed hope that fisheries sustainability and biodiversity conservation can be reconciled. Lake Victoria was a haven for haplochromine cichlids and heaven for evolutionary biologists; over time, the small fish evolved into more than 500 related, yet distinct, variations not found elsewhere, making the lake irresistible to researchers. Then, on a fateful day in 1954, a few non-native Nile perch were dumped into Victoria’s waters. The idea was to bolster a flagging fishing industry with a hearty new species. From the shore, the experiment appeared to fail, but a bloody revolution churned slowly, silently beneath the waves. By the 1980s, the world’s largest tropical lake swarmed with insatiable six-foot, 300-pound predators. While the three countries that share Victoria’s waters (Kenya, Tanzania, Uganda) enjoyed a booming Nile perch export market, the World Conservation Union, an international network of government agencies and NGOs, ranked the voracious fish among the top 100 “worst invasive alien species.” The problem isn’t just that Nile perch devour cichlids and the lake’s other native species (although the upsurge of Nile perch in the 1980s coincided with the demise of about half the cichlid populations): the perch’s higher than most oil content also set off a calamitous domino chain. Fishermen need to build bigger fires to dry their oily catch. Bigger fires require more firewood. Fewer trees increase erosion. Erosion boosts the lake’s nutrient level (eutrophication) as soil tumbles into the water. Eutrophied waters nurture an unnaturally dense plant population, which dramatically upsets the delicate eco-balance. The result: an economically lucrative, ecologically devastating situation. But does a fisherman’s bonanza necessarily spell curtains for biodiversity? Lauren Chapman sees a light, albeit faint. 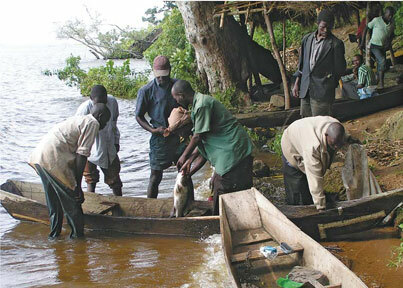 There’s no doubt Lake Victoria has seen catastrophic loss in recent years, but she believes a balance can be struck between environmental conservation and maintaining an industry that annually exports over $200-million in perch. East Africa’s bountiful papyrus swamps are extremely hypoxic—and, for Chapman, a very useful model system for exploring adaptations to low-oxygen stress. There, her team discovered novel responses to extreme hypoxia; the researchers are now exploring the role of oxygen in the evolution of biological diversity in fish. By rearing fish under different oxygen conditions back at McGill’s Stewart Biological Sciences Building, she can detect hypoxia-induced changes in morphology, physiology and behaviour. Chapman’s work has contributed to a growing awareness of the importance of wetlands as both refuges for native fish and nursery areas for commercially important fish. In 1995, Uganda issued a national wetlands policy, curtailing drainage and insisting that all users adopt sustainable practices. Community-based conservation efforts focus on specific wetlands, working on ways to use these habitats in sustainable ways (e.g., fishing, harvesting plant materials for use in construction, ecotourism) rather than large-scale conversion to agricultural land. The Nile perch, meanwhile, continues to respond to the cascading effects of its own introduction. When they first entered the Lake Victoria system, the perch fed on haplochromine cichlids. In fact, they liked eating cichlids so much that young perch fast-tracked the transition from an insect diet to a fish one, making the leap when they were a mere 5 to 15 centimetres long. When cichlid levels got too low, the perch were forced to feed on Rastrineobola argentea (a native minnow), Caridina nilotica (a native shrimp) and even their own young; faced with this B-list fish diet, young perch tended to stick to insects until they were over 30 centimetres long. “It’s thought that the perch grow fastest when they’re feeding on haplochromine cichlids,” says Chapman. Uganda may prove a valuable role model for the rest of the world. “Due to the increasing influx of municipal wastes and fertilizers, hypoxic stress in fish is really becoming a global issue,” says Chapman. As an example, she cites the Gulf of Mexico, where springtime fertilizer run-off creates an annual oxygen-starved “dead zone” (estimated to be the size of New Jersey, and growing) unable to support ocean life. Professor Chapman is the Canada Research Chair in Respiratory Ecology and Aquatic Conservation. Her research has received funding from the National Science Foundation, USAID, the Wildlife Conservation Society, the National Geographic Society and the Natural Sciences and Engineering Research Council of Canada.